This Shaving Gift Set looks like a really cool gift idea and provides everything he needs for the perfect shave. 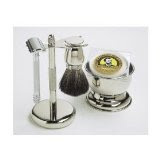 The Shaving Gift Set with Merkur Safety Razor, Bowl, Shaving Soap, Badger Brush, Stand and Safety Razor includes a chrome stand that holds a Merkur Classic Safety Razor and a badger Shaving Brush with a Chrome Handle. Also included is a Chrome Bowl that holds a Colonel Conk Shaving Soap. Click here>> for more information on this cool Shaving Gift Set.